I see the pictures in the magazines and watch the shows on HGTV and listen to the advice of professional “de-clutterers”. I want to be organized and tidy with a place for everything and everything in its place like some of my organizationally-gifted friends, but this desire is constantly at war with the side of me that still has eight ginormous storage containers of holiday decorations that have not seen the light of day since my husband and I separated nearly seven years ago sharing space with the garment bag full of velvet that I haven’t worn in more than a decade. I wish I could be more like “Pig Pen”, Charles Schultz’s walking dust storm. He is a “dust magnet” known for his perpetually filthy clothes and the cloud of dirt that follows him wherever he goes. When he takes a deep breath (to sing, for example), the dust rises briefly around him. 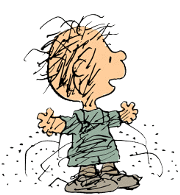 My problem doesn’t stem from the same lack of personal hygiene, but I am envious of “Pig Pen” and his very Zen-like ability to embrace his filth and disorganization, rather than fight against it. “Pig Pen” refers to the cloud that surrounds him with pride as the dust of “ancient civilizations” and cannot, in spite of his best efforts, stay clean and in fact on those rare occasions when he very briefly appeared clean, he was unrecognizable. That’s how I feel whenever I get my apartment looking exactly the way I want it. I don’t recognize it and I’m afraid to touch anything. It’s like one giant game of “Kerplunk” and frankly, who needs that kind of anxiety? Time for one more cup of coffee while I watch a show about how to turn stacks of old books into a coffee table and shoe boxes into a terrarium. Then I swear I’m going to fill those bags for the Goodwill.What about you? Have you embraced your inner “Pig Pen” or do you channel Martha Stewart, cringing while reading the above? Do you have a stash of stuff you can’t bear to part with or do you dutifully turn over your closets and haul your excess away every few months? Whether you wallow with me or offer me guidance, comments are always welcome. I’m a fellow Pig Pen fighter. I continuously seek the declutter and continuously have stuff overflowing. When you find the Zen….share it. Leave a reply on "The Zen of Pig Pen"